From writer / director George A. Romero, the man who unleashed Night of the Living Dead, comes Monkey Shines, a terrific psychological thriller that delivers a disturbing message about messing with Mother Nature. Starring Jason Beghe and Janine Turner, this riveting tale is a white-knuckle triumph that doesn’t let up! Allan Mann (Jason Beghe) is a bitter, angry and vengeful man ever since an accident left him paralyzed from the neck down. He’s fed up with himself and everyone around him. All that changes when he’s given Ella, a monkey trained to meet his every need. But when Ella begins anticipating Allan’s thoughts, strange and deadly things start happening. And as she stalks and wreaks havoc on Allan’s fair-weather girlfriend (Janine Turner), incompetent doctor and meddling mother, Allan realizes he must stop the cunning maniacal creature… before she fully takes over his mind! Kate McNeil, Joyce Van Patten, Stephen Root, John Pankow, and Stanley Tucci also star in this riveting thriller from the godfather of modern horror George A. Romero, presented on Blu-ray for the first time in the UK with an array of special features. 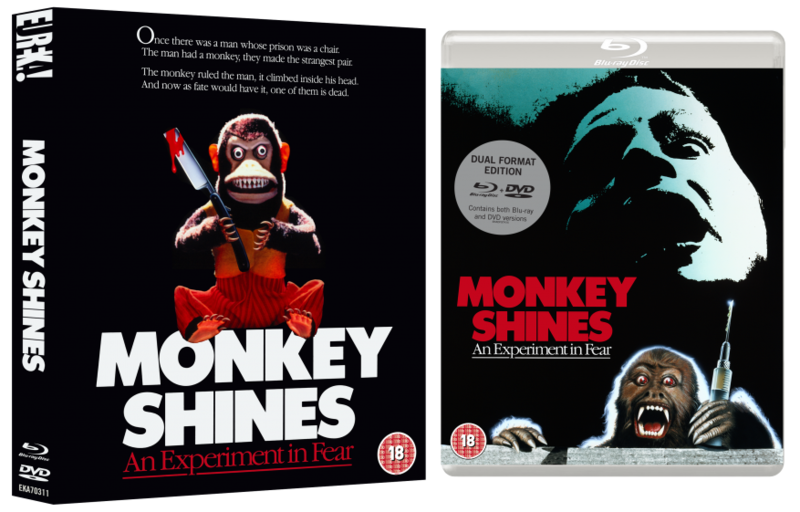 An Experiment in Fear – The Making of "Monkey Shines"